Reading books to children is a much more effective way to build vocabulary than family conversations or speech heard on TV or videos. Typically, an adult will only use nine 'rare' words per 1,000 words when speaking to a child under age five. There are three times as many of these less common words found in children's books than in everyday speech. When you read to your child, he or she hears more new words and develops a larger vocabulary more quickly. Hayes, D. and Ahrens, M. Vocabulary Simplification for Children: A Special Case of 'Motherese', Journal of Child Language. "Rephrase and extend your child's words, ask a clarifying question (tell me more about the man you saw), model more complex vocabulary or sentence structure (yes, I see the tall skyscraper you built with lots of windows), and ask open-ended questions," says Susan Hall and Louisa Moats of Straight Talk About Reading. Good readers have a diverse vocabulary. They ask questions when they are unclear about what a word means, they use the context of a conversation or the action in a book to decipher the meaning of unfamiliar words and they use varied vocabulary in referring to familiar objects (this bird is big, but this elephant is gigantic). 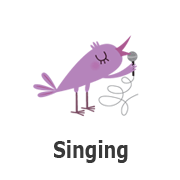 Read a rhyming book from the "Singing" booklist. Say or sing rhymes. Pick out rhyming words and talk about how the middle and endings sound alike. Say or sing a rhyme again and stop before a rhyming word. Have your child fill in the missing word. Count the number of days in November. Count the number of weeks. Talk to your child about the number of days in each week and the number of weeks in each month. Attend the Library's "Super Sing-Along" program this month. Learn some new songs and sing old favorites. Find program schedules at www.WB-Buzz.org. Read five books from the "Singing" booklist. Use music at home as part of your daily routine. Whether you listen to the radio, CD, or sing nursery rhymes, it does not matter what type of music. Music is good for calming down at bedtime, transition times, and creative times. Music of all sorts can stimulate your brain, incorporate rhythm and rhyme into your language, vocabulary and learning. Preschoolers learn best in social environments with a lot of movement. Music and movement are part of a preschooler’s daily lives incorporated into play, games, conversations, imagination, props, stories, reflection and social tasks. Preschoolers love active, manipulative, and creative musical environments essential to the development of their young minds. Sing songs while you clean up, dance while you set the table, and listen to music as you cook. Your child will use these experiences as a great source of education.